In early 2008 or thereabouts, I purchased two small skeins of Regia 4-fädig Patch Antik Color sock yarn in the colorway 5753 Beige. This self-striping yarn alternates between three shades of beige and three shades of gray, with a little bit of ivory thrown in. To me, this yarn is the workhorse of neutral color ways. 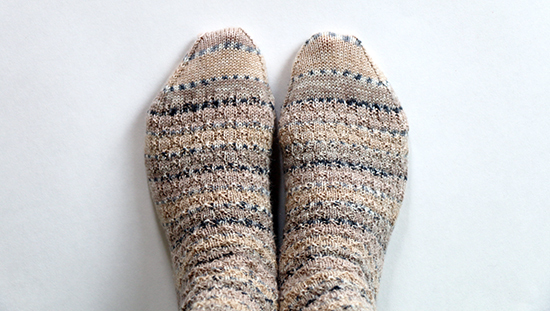 The socks I knit from it coordinate with warm or cool colors, lights or darks, without drawing too much attention. Now, don’t get me wrong; I love my bright and colorful hand-knit socks. But some days require an understated look, and that's when I reach for my beige-and-gray socks. By 2011, the colorway was still in stock at my local yarn shop. Knowing that good neutrals can be difficult to find, I bought enough to make another pair of socks. Then I promptly put that yarn away to move on to more colorful knitting. There aren’t any local yarn shops in the vicinity of our new home. As frustrating as that fact may be, it has provided me with an opportunity to work through my yarn stash. I’ve come to my last full skeins of sock yarn: the Regia yarn I purchased in 2011. 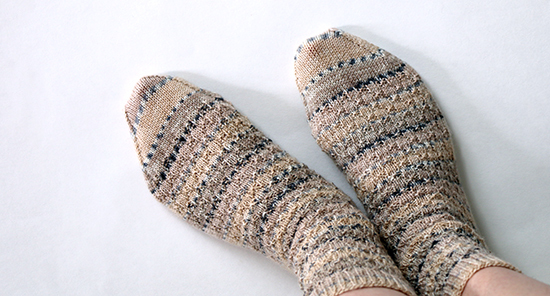 For the first pair of beige-and-gray socks, I wanted to use a pattern that would highlight the colorway’s horizontal stripes. Back then, I knit Stansfield #10 from the book “Sensational Knitted Socks” by Charlene Schurch. For my second pair, I decided to stay with that theme and chose Schurch’s Stansfield #11 from the same book. 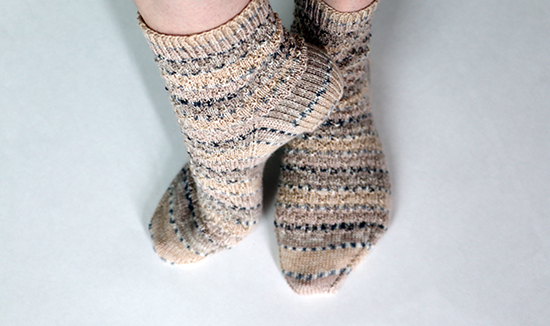 I’ve knit enough socks from Schurch’s patterns that the knitting itself was straightforward. I cast on 78 stitches and used four US-1 (2.25 mm) double-point needles for a gauge of nine stitches per inch. When I started the second sock in the pair, I simply began knitting from the end of the skein. I thought it wouldn’t matter if the stripes on the two socks didn’t align because the colors and pattern are the same. About two inches (2.5 cm) in, I had to stop. I couldn’t continue with the colors so blatantly uneven. I unraveled the knitting and restarted at a point where the colors matched the first sock. While that misalignment bothered me, I consciously chose to knit a flapped heel rather than an afterthought or short row heel. The latter techniques would have kept the stripes consistent on the front of the sock, but I prefer the flapped heel process. The changes in the stripes aren’t glaringly obvious, plus they’re the same across both socks. Likewise, it doesn’t concern me that the stripes don’t line up at the toes. I see this as part of the handmade nature of knitting. As much as I love this colorway, I’m glad I used up what I had. I’m ready to find a new favorite neutral. And with my sock drawer full, it’s time to explore new projects as well. What are your go-to colors? If I knit (and I wish I could) I'd love this yarn. I wear lots of neutrals just because they are easy and don't draw attention to me. But for quilting, I love bright happy colors. I just finished a beautiful purple quilt for a customer. I had such fun and part of that is the color. Cool, hot, neutral...I guess I just love them all. Your socks are just so pretty! I don't see even the smallest flaw. The stripes are perfectly handmade and match. Thank you, Mary! I tend to wear a lot of blacks and grays, but I also lean toward brighter colors for my projects.